In my previous blog post about my preferred new features in Captivate 2017 I mentioned that the dialog box for Advanced Actions got a nice new layout. It is like new shoes, sometimes it takes time before they feel as comfortable as those old sneakers :). The focus of this article is on clarifying that new dialog box. Maybe you'll discover some unknown gems here as well? I recommend to download the example published file, or watch it (as SWF output) in that article if you are using a Flash enabled browser on a desktop or laptop. 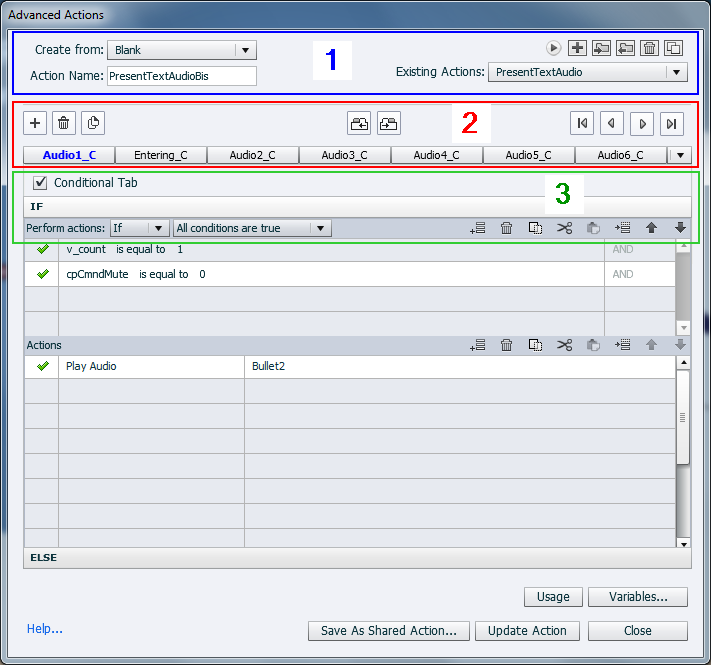 Section 1: with the Global control panel to the right, two dropdown lists and the Action name field. That field has to be filled in for an advanced action, but not when your goal is to create a shared action (see Dare To Share). Section 2: has the control panel and navigation possibilities for the Decisions. Decision is the name used in the official Help documentation for those parts of the action that have the generic names 'Untitled_1'...(and function as buttons to navigate to a decision). When opening the dialog box a default number of 3 decisions will be present. You'll see in the screenshots that I am used to rename those decisions, certainly for an action with multiple decisions. Section 3: shows the type of decision, has the control panel for the Commands or actions. I prefer the word commands to avoid confusion. Nothing has changed at the bottom of the dialog box, with the buttons Usage (for the active Advanced action; for Shared actions you'll find the Usage button in the Library), Variables (which allows you to open the Variables dialog box if you want to create more user variables or check the available variables, you cannot delete variables when entering the dialog box from this button), Save as Shared Action... (will open the Shared Actions dialog box), Save or Update Action and the Close button. Create from: followed by a dropdown list. I call this the actions template list. It will have the default template 'Blank' on top, but also the name of all shared actions in the project. One of the possibilities of shared actions is to use them as a template for a normal advanced action. The list is not alphabetically ordered. You can type the first character to navigate to a template starting with that character. Preview button: this button is still unknown by many users, and has become even more useful than before. In previous versions you could only see a conditional action in this Preview, but since the former standard actions are now embedded in the same interface, you can also preview standard actions. 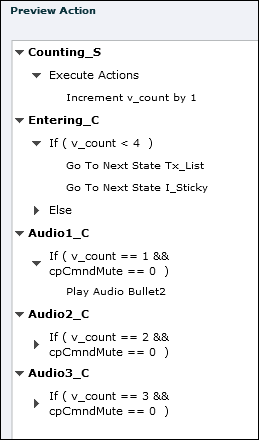 Here is a screenshot of such a simple standard action. Watch the indicator 'Execute Actions' which means that this is a standard action. Create New Action is the + button. It is no longer necessary to choose first of all the type of action, which was the case in previous versions. Import Shared Action: works only for shared actions (doesn't appear in the tooltip). That same button is to be found in the Library. Personally I always prefer to import (and export) shared actions from the Library. Export Shared Action: works only for shared actions (doesn't appear in the tooltip), same button as in the Library. Duplicate action: can be very useful. In some instances duplicate advanced actions are to be preferred to shared actions (maybe a future blog post). 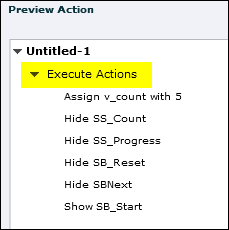 Action name: compulsory for advanced actions. Be careful with names (sorry for the repetition), do not use names that are used for other items. Existing Actions: has a dropdown list, ordered alphabetically. You can type the first character to navigate to an action starting with that character. Add decision (+ button): the decision will be added after the active decision (its name is bold and blue, non-active decisions have their name in regular black font). Duplicate decision: very useful. Look above at the second Preview example where decisions 4 and 5 are very similar to decision 3 and have been created with this button. Copy (CTRL-C) will copy the selected line(s). Move Up: the selected line(s), can be useful because of the importance of sequence of commands. Move Down: the selected line(s), can be useful because of the importance of sequence of commands. This type has only one control panel, since there is only one part in this type: the list of commands that have to be done in the chosen sequence. As told before, you can select a number of commands and paste them to the clipboard. They can be used within the same advanced action, in other decisions of any type, but only in the so-called 'Actions' part. However you can paste the copied lines also to another advanced action, with the same restriction. The three parts of this action: Condition, THEN (is not mentioned like that, second part under the Condition, ELSE have a control panel as described before. You can always copy/paste between the Actions part (THEN and ELSE), but the Condition part is 'standalone'. The first screenshot also shows the dropdown list, because you can define different conditions with AND (all conditions have to be fulfilled), OR or a combination of both (be careful with the last option). For the Conditions the situation is identical to Type 3 (AND, OR, Custom). This type has only two parts however: the Condition and the list of commands that have to be repeated as long as the condition part results in True. Two parts means two control panels, not interchangeable. But you can copy/paste from another decision or action, as long as you remain in the same part (condition or Actions). I hope this bit boring overview was useful for you. Promised: next blog posts will be practical, still busy with examples concerning Pausing the Timeline (focus on audio). Explanation of usage of the new While loop, with some examples is on the way as well. Not to forget: the very useful integration of Go to Next/Previous State in advanced actions: you'll get a tutorial for a user controlled or non-controlled presentation as well. TIP: for complicated actions with many decisions of all types, I add an extra character to the name: '..._S' for a standard decision, '...._C' for a conditional IF decision, and '...._W' for a conditional while loop. Easier to identify. If you have questions, issues with the Advanced actions of any kind, please fire away! Dank voor de commentaar, Nathan. CC is zeker niet mijn specialiteit, wel die van andere gebruikers. Wellicht post je deze vraag beter op het forum, zodat die kunnen antwoorden? Het is ook mogelijk dat je op een bug bent gebotst, niet onwaarschijnlijk gezien CC ook opgewaardeerd werd in deze versie. Heb je al geprobeerd met een nieuw, niet upgraded, project? Upgrading leidt vaak tot dit type problemen. SInce it is not possible to insert parentheses, I recommend to avoid combinatinos of AND & OR, they may be unpredictable. Mostly it is perfectly possible to avoid them, by using multiple decisions based on the fact that the advanced action is alwayd evaluated totally, from left to right and from top to bottom. Sorry missed the second part. If you are tlaking about the CC as is included in Captivate, it is perfectly possbible to use an action to toggle that feature. I have described it in another blog post: http://blog.lilybiri.com/1-action-equals-5-togg... IIf you talk about something else, please put your question on the forum. I perhaps didn't word that very well. I need to know if an AND or OR at the end of a line controls that item, or the item on the next line. Also, do you have suggestions for making Captivate recognize when closed captioning (cpCmndCC) is ON or OFF? Since Captivate doesn't allow Closed Caption text to be displayed when Advanced Actions plays the associated voiceover sound file, we must create 'fake' cc text in the form of a text box. I can make this appear at all times, whether closed captioning is ON or OFF, but I'd like to be able to keep the fake cc text hidden if the user doesn't have cc activated. Both AND and OR need two conditions, do not understand what your ask. Please, ask your questions on the forum. They are not related to the content of this blog post, but to the logic of a condition. This is difficult to describe, but I'll try... Let's say we have an IF section of an advanced Action with 2 line items: 1. variable x is equal to 0 AND 2. Variable value is equal to 1 AND Does the 'AND' for each line item describe that line item (the 'AND' applies to that line), or does the 'AND' apply to the following line, like reading a sentence ('variable x is equal to 0 AND Variable value is equal to 1') More specifically (since this example has 2 ANDs): 1. variable x is equal to 0 OR 2. Variable value is equal to 1 AND Does the 'OR' relate to 'variable x', making it the exception to AND, or does the 'OR' relate to the 2nd line, 'Variable value'?